For a paper at university we have to use the IEEE style -- which can be done using IEEEtran LaTeX file. What we also have to take care of, though, is that the bibliography is German as well. J. F. Kelly and P. Hood-Daniel, Printing in Plastic: Build Your Own 3D Printer, 1st ed. Apress, Jun. 2011. H.-J. Warnecke, E. Westkämper, and M. Decker, Einführung in die Fertigungstechnik, 7th ed. Wiesbaden: B. G. Teubner Verlag / GWV Fachverlage GmbH, 2006. So I always have to change the files manually after exporting my bibliography out of Zotero (the organising tool I use). However, some urls are still problematic, you have to add some more possible breakpoints. See documentation for package url or search here. Not the answer you're looking for? 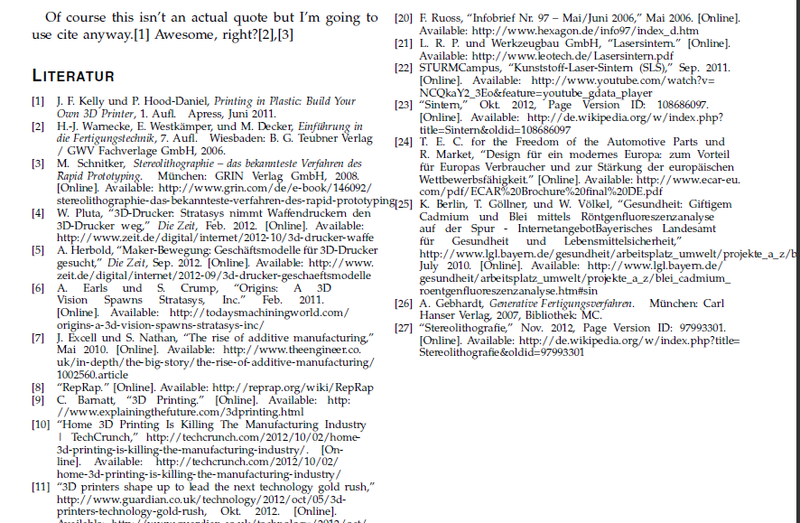 Browse other questions tagged bibtex languages ieeetran or ask your own question.